Converting your paper-based records into electronic documents can yield innumerable benefits: more efficient access to information saving executive and clerical time and reducing physical records storage requirements. With information available at the click of a mouse, you can free up valuable floor space by eliminating paper files. Each document can be protected, with offsite back-up to ensure disaster recovery. Eliminating paper files will make running your business much smoother. Save time and energy by simply retrieving your files digitally in a much more efficient manner. Digital document imaging and scanning removes the worry of damage to your files due to fire, flooding, natural disasters, or other unforeseen catastrophes. Why choose BSC to do your scanning? How to access the digital documents? Once BSC has converted your records, we will help you come up with a solution for storing and accessing them. If you have an in-house document management system that is in place, we’ll help you upload the documents to it. As another option, we can also burn them to a DVD or CD. Should you want ongoing access, we’ll host them on a secure FTP site for you. 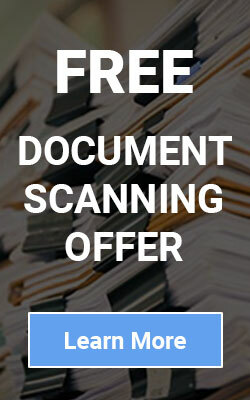 Scan on Demand As needed, we can scan and index stored documents for you. The image and data can then be provided. Ongoing Document scanning On a regular schedule, documents are picked up from your location safely and securely by BSC. They are then transported to BSC to be scanned and indexed into paperless records. We have done projects were scan onsite as well. Backfile Document Scanning Catch up with that backlog of paper. Large or small document quantities are scanned and indexed to enable you to electronically capture existing paper files. This is a great solution for those that have an electronic document management system in place for day-forward imaging but need to catch up with existing paper files. You get all images and metadata downloaded to your image repository system or provided to you on disk or hard drive. Day Forward Scanning Once your files are scanned and put an electronic content management system, BSC can continue to scan the newer documents that you don’t have time to scan yourself.